Late 1960s Kawai/Teisco Japanese Electric Guitar – Drowning in Guitars! I call this one my “glass” guitar! Another pawn shop prize, this guitar has a really odd finish. It’s coated in the typical poly finish of the time, but the finish is really clear and THICK! I remember when I was a kid there were little knick-knack kinda things, that were submerged and “frozen” in a plasticized chunk. Remember them? Like bugs in an ice cube? Anyway, this guitar has this thick finish on it and it has depth, like you see the wood way in there. Hard to explain, but I try. So after I pull my eyes away from the depth of that finish, the next thing I immediately notice are the pickups! I’ve never seen any like these before, and I’m always excited about documenting stuff like this! They’re like copies of DeArmonds, maybe? I’m not sure. The pickups have pretty good output (all reading in the 5k range) but the middle pickup was wired out of phase from the factory. This is a really common phenomenon with vintage Japanese guitars. Dano Dave D’Amelio rewired this and puts it this way: “Take off the cover and locate the wires coming out of the pickup, and flip the hot and ground. The ground for the pickups has to have it’s own separate wire, so I attached and isolated a separate ground wire.” Dano did all the work on this guitar and once again, he turned an unplayable guitar into something that’s usable and will play great on an everyday basis! So he fixed the pickup wiring and changed out the typical low value pots. The volume and tone pots were both 100k, so he changed them to a higher value for increased treble and overall output. The wiring on this guitar is parallel, and there is a functioning tone switch next to the volume and tone knobs. The pickups are all turned on and off by corresponding switches, and with a little work by Dano, they all function perfectly. This guitar also has an aluminum pickguard, and I think something has to be said about this. Dano points this out all the time, that guitars with aluminum pickguards seem to have this special extra sound thing going on. Maybe it’s the way the metal vibrates, or the way the pickup magnets affect the surrounding metal, or maybe everything just “breathes” differently from plastic. There is just something extra with metal guards. I happen to agree! Dano also put a lot of work into set-up on this guitar. He leveled and dressed all the frets, and spent a ton of time on the neck angle! This is really labor intensive work and most people just never take the time. Let’s just say it involves taking the neck off and on, A LOT!! Speaking of the neck on this one, it is just HUGE and has a wonderful V-shape. I find it totally comfy to play! I was initially totally stumped as to who made this guitar. As usual there aren’t any identifying markings anywhere. Normally I just say “Kawai” when I see an oddball guitar like this, and after consulting a few different forums, I think I narrowed this guitar down to the late 60s period when Kawai had purchased Teisco and churned out very strange guitars that have similarities to older models offered by both Teisco and Kawai. Check out that headstock and that interesting slanted carve. It is something I’ve seen a few times before. A fine guy on the Matsumoku forum pointed out that this guitar’s body is very similar to the TG series Teiscos. Remember the “Monkey Grip” guitar? 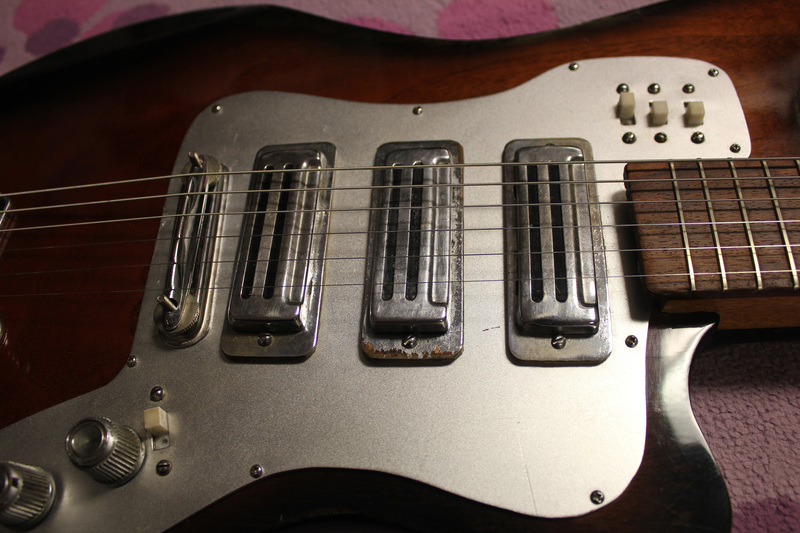 I bet there were a bunch of old Teisco bodies that just didn’t make the cut back then, so Kawai just used them up by dipping them in a thick finish to cover up any imperfections! That’s just my theory, but I do know that most of the Japanese factories were very cost conscious, so who knows? Either way, this is just a cool, playable vintage guitar that deserves some love, and that’s just what we all gave this old gal! Finally check out Mike Dugan playing this guitar. We used a Fulltone OCD for the dirt, and the faithful Ampeg Gemini I for the amp. Enjoy! Cool guitar and great article. I need some help. 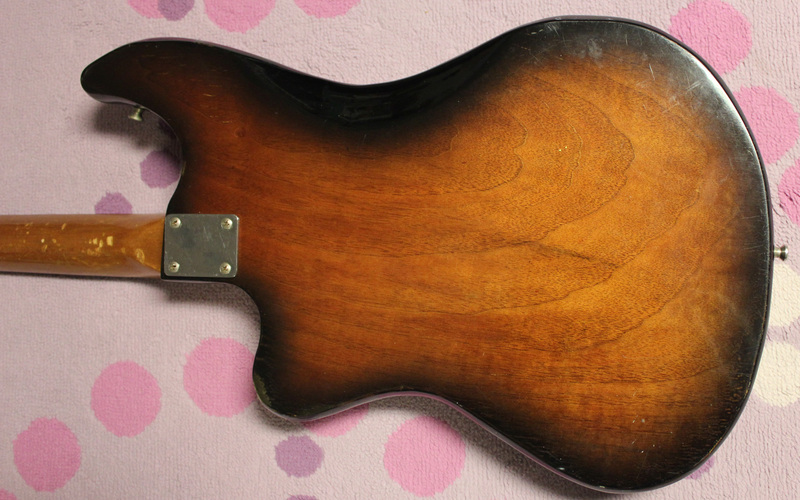 I’m restoring my original Teisco Spectrum 5 and I need a bridge. Do you have one or know where can I find one? This is an important project for me. I got this guitar when I was 9 from my Dad and I’m 43 now. I’d like to bring back great memories by restoring the guitar and having my Dad see and hear that guitar. Any help will be greatly appreciated. Spectrum 5 guitars are REALLY great, and I hope to own one someday. I love the connection you have to that guitar through your dad, and I think a lot of people have connections to these instruments in the same way, through their dad (or mom). Those original bridges will be hard to find because it seems like they were specific to the Spectrum 5 and maybe a few others. They aren’t the generic typical bridge. Contact Dano Dave or Nate DeMont through my links page for the best chance at parts. Dano’s worked on a few Spectrums and I seem to remember he worked around one that didn’t have an original bridge. I think he retro-fitted a different but similar bridge and it worked fine. Best of luck and thanks for the comment! I also need a few spectrum 5 bridge parts. Any asistance would be greatly appreciated. Specifically, the sting saddles, round bar, and whangy bar. I was wondering if you had pictures of the guts of the wiring? Or maybe even a wiring diagram? I just picked up a Teisco with 3 gold foils, and a similar array of knobs and switches. Unfortunately it needs a rewire! Please get back to me. Hey Hoyt, sorry man but I’m not an electronics guy and don’t own this guitar anymore.